In a small bowl combine sugar and strawberries. Set aside. Place 4 pound cake slices on 4 individual plates. 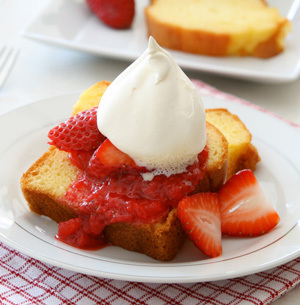 Place 2 tbsp of strawberries on each slice and top with a small dollop of Rich Whip® Whipped Topping. Top initial layer of cake and strawberries with the second cake slice, strawberries and remaining Rich Whip® Whipped Topping.